The Wild Kratts LIVE! stage show that has kids across North America buzzing is coming to Salt Lake City with an ALL NEW show: “Wild Kratts LIVE 2.0 – Activate Creature Power!” Get ready to dive into another classic Wild Kratts adventure with the Kratt brothers as they combine live action and animation, with Martin and Chris LIVE on stage and the rest of the Wild Kratts team on screen, at the Tortuga HQ. Which creature powers will they activate and what new and amazing ‘WOW!’ facts will you learn? Experience, live-on-stage, the electrifying excitement and the inspiring quest of the Kratt Brothers that make the hit television series Wild Kratts a family favorite time and time again! Public on-sale for the Salt Lake City engagement is Friday, May 3, 10:00am. Tickets will be available online at Live-at-the-Eccles.com, calling 801-355-2787 or visiting the Eccles Theater Box Office (Mon-Fri 10am-6pm & Sat 10am-2pm). The George S. and Dolores Doré Eccles Theater is located at 131 Main Street in Salt Lake City. 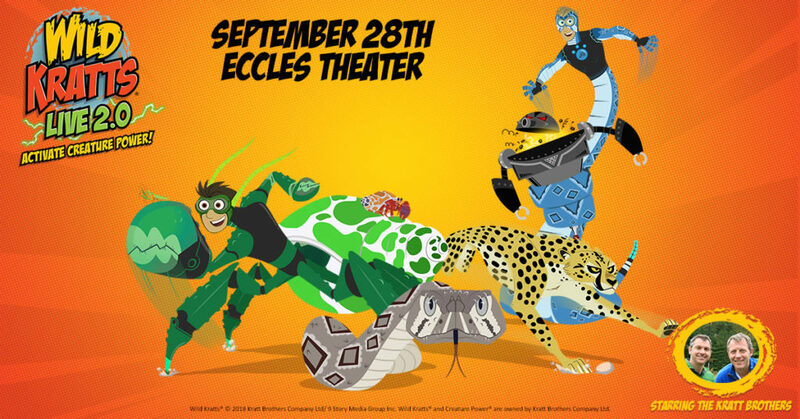 Wild Kratts LIVE 2.0 will be at Eccles Theater in Salt Lake City on September 28, 2019 at 1:00pm. Fans can go to https://live-at-the-eccles.com/e-club to register for a pre-sale code that will give them early access to tickets. A limited number of VIP tickets will be available for this pre-sale. Each VIP ticket includes a premium seat at the show, a meet and greet with Chris and Martin Kratt, a personally autographed color photo, and photograph with the brothers that is taken with a personal camera. Since 2014, Wild Kratts LIVE! has performed over 225 shows for hundreds of thousands of fans in over 135 cities across North America. It was created for the stage by the imaginative minds of Martin and Chris Kratt from Zoboomafoo, Kratt’s Creatures, and Kratt Bros. Be the Creature. The PBS KIDS TV show, Wild Kratts, was created and developed by brothers and zoologists Martin and Chris Kratt and is currently in its sixth season. The series follows the animated versions of the Kratt brothers and their friends on hilarious expeditions with wild animals from around the world, complete with animal-inspired gadgets and awesome Creature Power Suits that enable the adventurers to get close to the creatures. The real-life Chris and Martin introduce each Wild Kratts episode with a live-action segment that imagines what it would be like to experience a never-before-seen wildlife occurrence, and asks, “What if…?” to set the story in motion. Wild Kratts has recently been nominated for a 6 Daytime Emmy, most recently a 2018 nomination for Best Children’s Animated Program. The series is a co-production of the Kratt Brothers Company and 9 Story Entertainment.